At the time of this review, the book holds a 4.4-star review on Amazon with 101 reviews. Book Obtained By: Borrowed from the library after researching Entangled Teen acquisitions editor Lydia Sharp (before pitching my novel to her at Cleveland Rocks Writers Conference), because the Amazon teaser pages hooked me, and I already have too many books on my shelf to be read. “I raise my chin, carefully keeping my shoulders wide and my face passive. Strong. I will make an impression here, or I will die for my loose tongue. It’s that simple. Because unlike the girls next to me, I’m not here to impress the king and win a royal’s hand in marriage or a court position for my father. 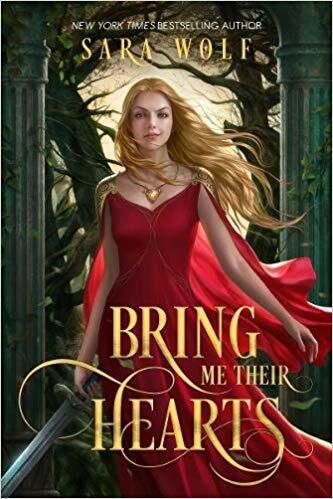 I’m here for Prince Lucien’s heart. New York Times best-selling author Sara Wolf introduces Zera, a Heartless. The Heartless owe their hearts to witches, typically because the witch brought them back from death, and now holds their heart captive in a jar. Heartless must do the witch’s bidding, and it takes an incredible amount of magic to kill a Heartless. They are monsters, needing to feed on bodies, on organs they tear fresh from the human or animal, or a care-giver gives them. They constantly battle to control those urges, and they can decimate a dozen armed humans. The book opens with the scene from the back cover copy. Zera’s tone goes beyond snarky. She’s downright mean, and that would have put me off, except for her worldview mixing yearning with a dash of hope and a heap of heart. Add in the mysteries about her that Wolf unveils one at a time and you have a recipe cooking long in the author’s head, I’m sure. Plus, despite Zera being a Heartless, the scenes demonstrate her sheer willpower in trying to control the beast within. At one point, I wasn’t sure I’d keep reading the story, because that mean snarkiness wore on me, except Wolf had hooked me. I wanted to put the book down, but I couldn’t. As the story progressed, and Zera developed, that snarkiness flowed to a softer level. Perhaps, too, the first-person narration present tense helped. Since everything was her thoughts, as if right now, I saw that battle to control herself. I wondered, what girl had she been before becoming Heartless. Wolf rewarded me a hundred-fold for continuing. The other thing that jarred me was the opening started at the present. Then we took a leap back to “five days earlier,” I think it was, and a lot of the backstory unfolds there. Stories on TV do this all the time, and it typically doesn’t bother me. It’s the first time in a number years, I believe, that a book I’ve read has used this technique. It jarred me, but I accepted it. Then, the longer the “five days ago” went, the more I questioned starting with that scene. One reason I kept reading, the incredibly fresh world Wolf has built here. A feudal society, but infused with magic and beasts at such level I would not consider it an alternate earth. Witches have long held magic here, and exist in great numbers. Wolf gives us races, some sentient and humanlike (Beneathers), others not (Valkerax). Among the variety comes one character to love, Malachite, the prince’s bodyguard. He’s a Beneather, making him a mighty foe even for a Heartless. He presents a layer of complexity for Zera, who could best take the prince’s heart if only she could get him alone, for she needs time to put it into the magical jar that will restore Lucien to life. Zera is a Heartless, true enough, and her hate for herself rings loud and true. She despises what she must do, despises the darkness within. Wolf gives that hunger for warm flesh an eerie voice, rather like I imagine an evil split personality. You want one thing, the other personality wants another. “WhiCh pArt should wE eaT first? The hunger slithers around her, resting my eyes on her neck, her wrists—the most tender parts. YoUr soFt eyEs, or your soFt hEart?” (p. 285) This, for a girl who might be Zera’s only friend in the entire court; and worse, her ally. It’s horrible for Zera, wanting conflicting things so terribly. Along the way, the cast of characters helps and hinders Zera. Someone must coach her be a lady, and that becomes Lady Y’Shennria’s role. Watching their relationship gave me as much delight as in watching Zera and Lucien. Wait, did I just use the word “watching?” You’ve got that right. Sure, I was reading, but Wolf painted this world, these characters, so descriptively I fell into the world. The story played out vividly before my mind’s eyes. I cringed, never knowing what side of Zera would win those moments she found herself alone, however briefly, with Lucien. Lucien, too, developed as a character. Not nearly to the depth of Zera, but this is her story of loss, of love, of—I hoped—redemption; of their relationship together. That relationship has its own arc. I curse the book for ending with a cliffhanger, losing me in what will happen between them. Yes, Wolf brought Zera’s initial arc to a conclusion suitable for saying “the end,” but I’m never a fan of an author that sets such a strong hook for book 2 that you feel unsatisfied in the current book’s ending. This book is a “must read” if you love YA fantasy and girls who carve out their place in the world. But don’t say I didn’t warn you, you’ll want book two now. Except Wolf’s not done with it! Learn more about Sara Wolf at her website. This entry was posted in Book Reviews and tagged amreading, Book Review, bookblogger, Fantasy, Sara Wolf, Young Adult. Bookmark the permalink.